The show airing April 15, 2019 – April , 2019 ‘highlights’ the WV Breast Health Initiative and the Union Mission. We interviewed Rachel Lester, Board Member with WVBHI and survivior of breast cancer. Rachel discussed the mission and purpose of the WV Breast Health Initiative. They are a new organization with an ongoing mission to increase breast cancer awareness and prevention across West Virginia, our great state. The Race for the Ribbon is set for May 4, 2019 at the WV State Capitol Complex with registration at 8:00 and the race at 9:00 a.m. Call 304-556-4808 for more information. 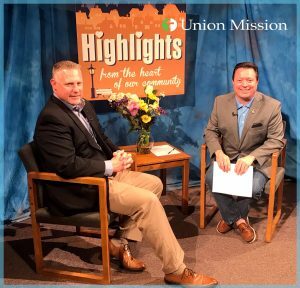 We also interviewed Jason Quintrell, President & CEO of Union Mission of WV. Jason discussed what the Union Mission is all about. Since 1911, Union Mission has been a ready, active hand of help to the needy of West Virginia. Their mission is “helping hurting people in Jesus’ name,” and as such, we unabashedly share the gospel of Jesus Christ even as we minister to the physical needs of the downtrodden. They have seen God work in amazing ways through our various ministries to improve lives and draw people closer to Him. All over our state, the Union Mission has gained a reputation of being there for those who have nowhere to turn. They just had a very successful Food Drive with the Bigley Piggly Wiggly on April 11, 2019. Now they are planning for their 4th Annual Women on a Mission Luncheon set for May 9, 2019 from noon to 1:30 at the Embassy Suites in Charleston, WV. At the event, five extraordinary women will be honored as they celebrate “The Gift of Giving” at this annual luncheon.. Please join them as we celebrate “The Gift of Giving”. Tickets are $50 each and can be purchased by contacting Lana McVey at 304.925.0366 ext. 142 or click here to buy online. Ticket purchase deadline is May 1st. Proceeds will support the work of Union Mission Ministries. Congratulations to the honorees for their devoted service to helping others!